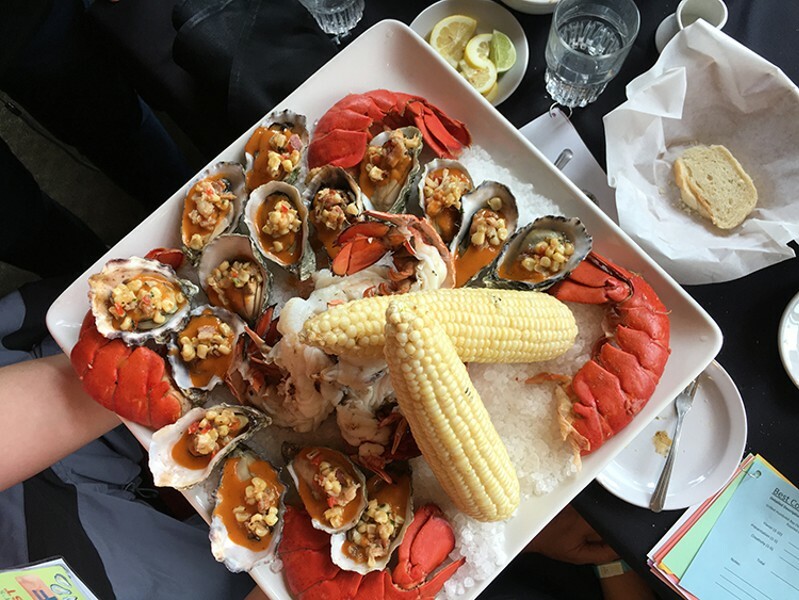 photo by Jennifer Fumiko Cahill A luxe lobster and oyster spread from Five Eleven. photo by Jennifer Fumiko Cahill Sushi Spot keeps the cooked crown for this creamy-spicy entry. photo by Jennifer Fumiko Cahill Savory Grill and Café's winning raw oysters. 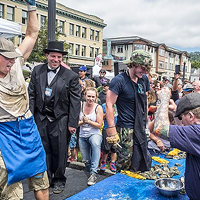 After nearly four hours on lockdown at Mazzotti's, judges for the Arcata Bay Oyster Festival handed in our score sheets for head Oystress Rachel Marrella and her team to tally and name the winners. Eight contenders served up raw and cooked oysters, and only four threw their hats in the ring for non-oyster honors. It's a small group compared to the scores of booths lining the plaza, though not surprising when you consider what goes into entering the competition. 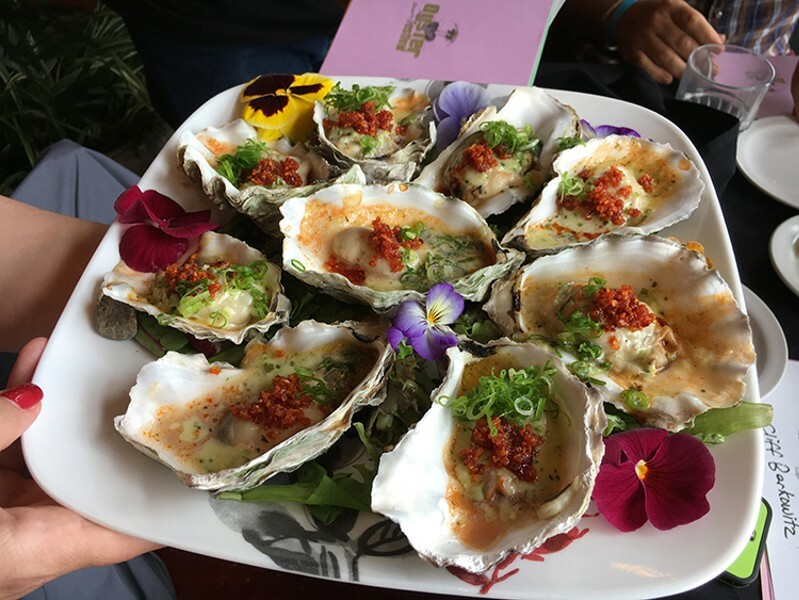 The coveted Best Raw went to newcomer Savory Grill and Cafe for its oysters served in a molcajete cauldron and topped with carmelized onions, pineapple, red wine vinegar, cilantro, lemon juice, shallots, garlic, olive oil, cherry tomatoes and chives. (And there's your recipe for Fourth of July, folks.) Sushi Spot, which swept last year's competition, stayed in the game with Best Cooked, serving up a showstopper of a barbecued Goose Point with a creamy, spicy-sweet topping of garlic-jalapeño aioli, honey sriracha, crunchy toasted garlic and green onions. Salt Fish House, in its first year at the festival, took Best Non-oyster with a skewer of grilled octopus, cherry tomatoes and olives, with lemon vinaigrette and mint. 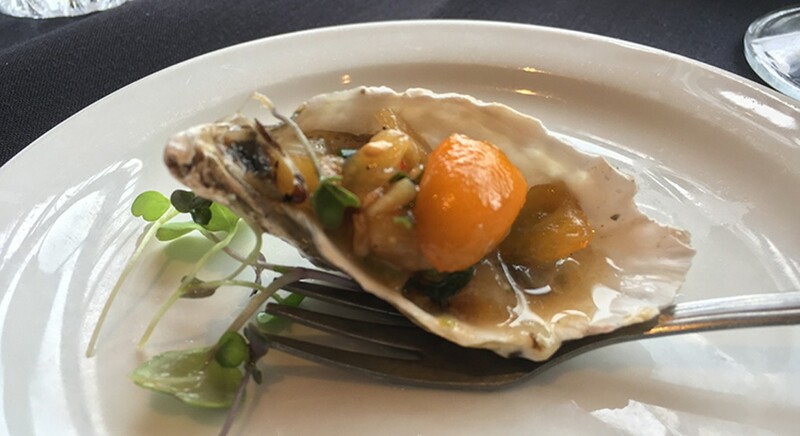 Restaurant Five Eleven, another first-timer, won the new category for Best in Show with a grilled Humboldt Bay oyster served with lobster sauce and roasted corn salsa, and a raw Humboldt Bay oyster with honeydew melon and cucumber gazpacho and golden trout caviar. (Its cooked oyster score was a mere .1 points behind Sushi Spot and the raw was .5 behind Savory's entry.) Josh Wiley, executive chef of Five Eleven has served as a judge in the past and kept that experience in mind preparing his entries. "As a judge, I've sucked down a room temperature raw oyster and it's not pleasant," he says. So he made sure to keep raw oysters packed in ice and to top hot oysters with piping hot sauce, removing them from the grill at the last possible moment. Wiley is pleased, if a little muddy on how the scoring worked. "Honestly, I personally don't care that much. It's good for the restaurant." Everybody likes to win but for some contenders there's a little more riding on the outcome. An engraved bowl doesn't have much impact for a high school cheerleading squad but for a restaurant, having a stall, much less taking home an award, makes for valuable publicity, even if the winning entry doesn't make it onto the regular menu. Wiley says he saw that effect when he was cooking at Plaza Grill, where oyster orders increased "exponentially" after an Oyster Fest win in the early 2000s. Still, a shot at that marketing boost doesn't come cheap. Having a booth at Oyster Fest is no simple thing. According to Festival Coordinator Nancy Stephenson, Arcata Main Street charges $600 for a spot, which doesn't include the required one-day insurance an outfit has to procure on its own. The Health Department will sell you a one-day permit for $65, which comes with a set of health and safety operating rules. You're going to need a covered tent — necessary for food prep — and all your own mobile kitchen equipment, from grills and charcoal to paper boats and toothpicks, not to mention last-minute incidentals, like additional oyster shuckers or replacing busted tongs. It all adds up. And you'd better have a hand washing station and proper food handling locked down if you want to pass the Health Department inspection on the morning of the event. One vendor, whom Stephenson declined to name, had to pack up and go home before the event even started this year due to a reported food handling violation. Once all that's squared away, there's the cost of ingredients and labor. If you're that fundraising cheerleading squad, you need to round up volunteers who are willing to show up at 5:30 a.m. and shuck, grill, serve and work a register until teardown 12 hours later. But if you're running a restaurant, you're looking at two shifts or overtime for four employees minimum. Five Eleven set up with a skeleton crew but had 12 staff members from 8:30 a.m. to 3:30 p.m., all of whom it had to pay around $15 per hour, totaling in the neighborhood of $1,200 for labor. The cost of oysters varies but Wiley got them for $7-$8 per dozen and sold them at $5 for three. "We did 4,300 oysters," he says, admitting the profit margin is thin. "You're not squeezing very much out of it," he adds. "If we made 500 bucks, I'll be surprised. ... If you make $1,000 out there, you're doing really good." Festival regulars Bear River Casino and Mazzotti's, both of which stay open and have to staff their dining rooms during the festival, abstained this year. Will those Best in Show mollusks make an appearance on Five Eleven's menu? Wiley has to pencil that out and see if the pricey sauce made from lobsters and the caviar topping make sense in terms of cost, but he'd like to serve it. And a marathon day of cooking nothing but oysters hasn't put him off our beloved bivalves. Still, he says, "I wasn't going out to have oysters that night, that's for sure." Jennifer Fumiko Cahill is the arts and features editor at the North Coast Journal. Reach her at 442-1400 extension 320 or Jennifer@northcoastjournal.com Follow her on Twitter @JFumikoCahill.